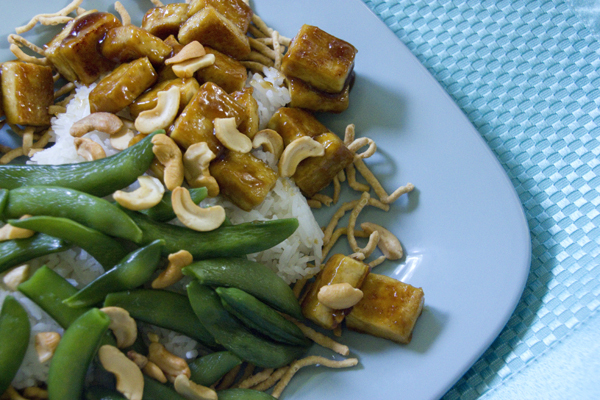 Full Disclosure: I was sent some coupons for free Nasoya tofu that I used in this recipe. I am not being compensated in any other way for this post, and the opinions are completely my own. Since I started blogging and trying new things more than 5 years ago (!!) there have been a few things that I had never had before and now have grown to love. Tofu is one of those things. It is now my go-to for stir fry, and other Asian dishes. The thing about tofu is that if it isn’t cooked properly, it can pretty weird textured and unappetizing. I started eating at restaurants first – particularly in pad thai – and then started making at home after deciding that I really liked it and actually preferred it to meats most of the time in stir fry dishes. The sauce is similar to a sweet and sour sauce, but definitely on the sweeter side. It is also a pretty thick sauce, which means that the tofu gets a nice coating of it and soaks up the flavor which I love. 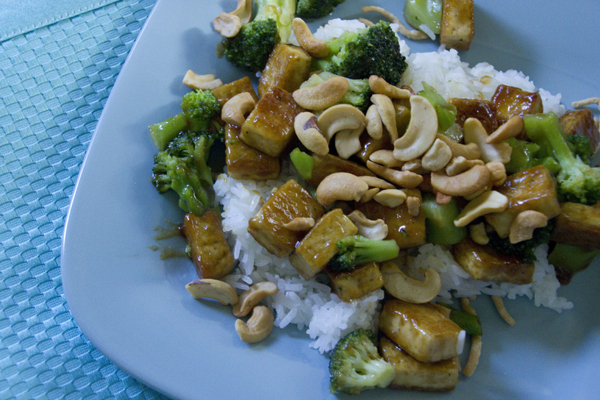 One of the things that I really enjoy about stir fry dishes is that they are usually very easily customizable. Often times, I substitute my veggie of choice (usually pea pods) instead of what is suggested, as you can see in the photo above. The husband is a fan of broccoli though, so he had that in his dish. Those steamer bags that lots of frozen veggies come in make it really easy to use different veggies without feeling like you are wasting a lot of food (and time) chopping, and boiling, and sautéing fresh veggies. Overall this dish was really tasty, and I’m sure we will make it again soon! Ease: A-, as with any stir fry recipe there is going to be a bit of work, but this was nothing out of the ordinary. Taste: A+, we both really liked it! It was a little sweet, but it still had great flavor. P.S. Nasoya is my favorite brand of tofu! Along with the extra firm that we used in the stir fry, they have serveral other varieties as well. (I am super bummed that they don’t carry it at my local grocery store any more though. Luckily they still have it at Target!) They also have a new(ish) product called TofuBaked which is already cooked and seasoned tofu that is a quick and convenient way to add tofu to salad or sandwiches. I haven’t been able to find TofuBaked near me yet, but hopefully soon! P.P.S There is a photo of grilled tofu and zucchini skewers on the front page of the Nasoya site right now and it looks DELICIOUS!